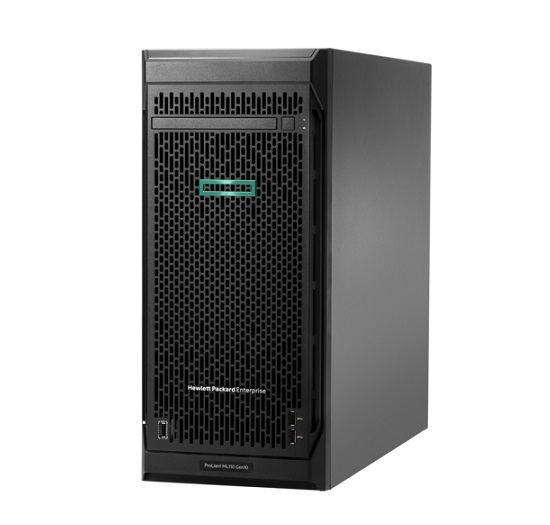 • The HPE ProLiant ML110 Gen10 Server is compact with less than a 19-inch depth, quiet, and affordable that can deliver the performance needed for the compute demands of a growing office small- to mid-sized business. • Supports industry standard technology leveraging the Intel Xeon Scalable Processors operating with speeds of up to 3.6 GHz and up to 14 cores offering improved performance. • Supports up to two optional graphic processing units (GPUs) allowing one double wide and one single wide card to boost performance in graphic and Virtual Desktop Infrastructure (VDI) applications such as financial services, education, scientific research and medical imaging. • The embedded HPE Dynamic Smart Array S100i Controller for SATA disk drives supports boot, data and media needs. These enhanced HPE Smart Array Controllers provide the flexibility to choose the optimal 12 Gbps controller most suited to your environment, as well as operate in both SAS and HBA modes. • The HPE ProLiant ML110 Gen10 Server offers up to six DIMM slots with support for up to 192 GB of HPE DDR4 SmartMemory, helping to prevent data loss and downtime with enhanced error handling while improving workload performance and power efficiency. • Support optional redundant fan and redundant power supplies reducing data loss and downtime, making your server more reliable. Flexible expansion capacity with five PCIe expansion slots, eight USB ports and one optional serial port. • HPE SmartDrives delivers enhanced performance, capacity, and reliability to meet various customer segments and workload requirements at the right economics. Support up to eight large form factor (LFF) disk drives or 16 small form factor (SFF) disk drive options. • The HPE ProLiant ML110 Gen10 Server is part of the Hewlett Packard Enterprise offering of industry-standard servers with major firmware anchored directly into the silicon. With security protection built-in across the server lifecycle starting with Silicon Root of Trust. • Secure Recovery allows server firmware to roll back to the last known reliable state or factory settings after detection of compromised code. • Millions of lines of firmware code run before server operating system boots and with Run-time Firmware Validation, enabled by HPE iLO Advanced Premium Security Edition, the server firmware is checked every 24 hours verifying validity and credibility of essential system firmware. • Processor: Intel Xeon-B 3104 Six-Core (1.7GHz 11MB L3 Cache). Single socket populated.